Original artwork postcard invitations, including our most popular Monkey Baby Shower Invitations design! Looking for something less formal for your baby shower invitations? These unique free postcard invitations are the perfect solution. Unique invitation designs are adorable, easy to print and easy to send! Try our free printable baby shower invitations designed into a postcard style that coordinate perfectly with your Sacco Bambino® Unique Baby Gifts purchase. Sometimes we like to have a little something less formal for invitations. Besides being unique printable baby shower invitations, these free postcard style invitations are also convenient. Set up 4 per 8-1/2" X 11" page ... just print, cut, fill them out, attach a stamp and drop them into the mailbox. It's so easy! Select a thick, slightly textured paper, or a card stock, 110 lb. weight, or slightly thicker, depending on your personal preference. Complete instructions are included on the download page. They're fun, easy to download, print and send. Please Enjoy! Subscribe to our Free Sacco Bambino VIP Newsletter, Keep In Touch and get access to our Free Baby Shower Invitations Library ... a great savings on free printable baby shower invitations. More Sacco Bambino® Free Printable Baby Shower Invitations! Important Notice: Sacco Bambino® Postcard Baby Shower Invitations are copyrighted items and are for Personal Use Only. Not for resale, commercial use or mass distribution. Keep updated on all of our specials and promotions. 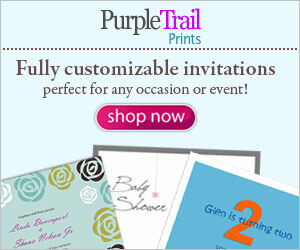 Including our Free Baby Shower Invitations Library, only for VIP Subscribers. Keep In Touch!! Want To Dazzle Your Guests? Find amazing ideas for Seasonal and Holiday Baby Showers & Invitations on our Unique Baby Shower Themes & Ideas page.